From Turf or the dales of Honeybee? What men or gods made thee? What charry oak? 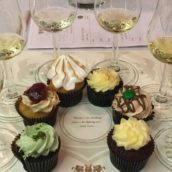 What peaty fruit? What struggle to surpass? What butts and hogsheads? What viscimetry? Apologies to you too, dear reader, for that dreadful pastiche. My only excuse is that it gives you an insight into the strange things that Laphroaig 10 year old has done to my psyche. It’s fair to say that most people who know me, or have met me a few times, or have ever got stuck talking to me at a party, know of my love for Laphroaig. Specifically the ten year old, more specifically the ten year old produced in the period between the end of the 1980s and the turn of the millennium. Don’t get me wrong, I really love the old 15 year old too, may it rest in peace. I’m also very fond of the Quarter Cask and the 18 year old. 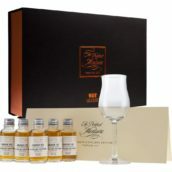 The cask strength 25 year old, and particularly the 30 year old, are outstanding. But it’s the old ’90s 10 year old to which I always return. 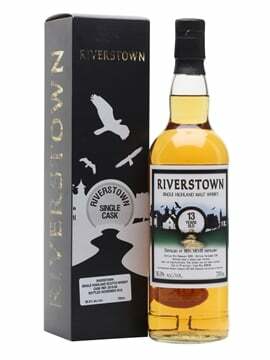 I like the cask strength 10yo from that era a lot as well (especially the legendary duty-free ‘Straight From The Wood’ fruitbomb of the mid-90s), but it’s the humble 40-43% 10yo that’s my real favourite. 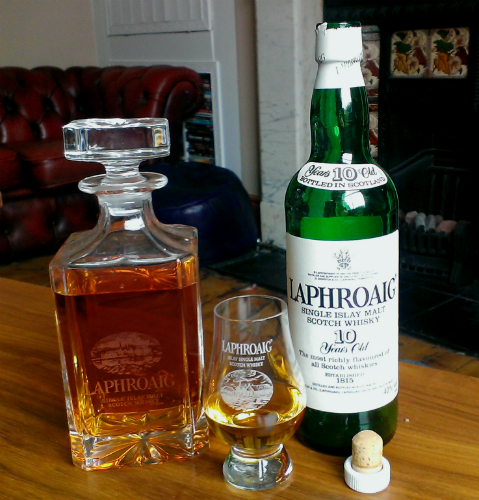 Before you say it, I’m well aware that the early ’80s and ’70s Laphroaig 10yo is even better. But it’s at least ten times more expensive as well (the 1970s bog standard Laphroaig 10yo is probably, along with Lagavulin 12yo from the same era, the greatest whisky investment of all time, if you’d lumped on a few cases of each). But back in the real world, the ’90s 10yo is occasionally ridiculously good. For value, it’s unbeatable in my opinion. For me, it all started a few years ago in the most prosaic fashion during the dreaded TWE stock-count. Not the most likely of situations for the genesis of what was to become a fully-blown village-auction-stalking obsession, but there you go. While counting the manifold different Laphroaig 10yos (at last count we have 28 different codes for OB Laphroaig 10yo, but back then it was probably only 23 or so), I realised that we had two bottles that didn’t fit any of the existing codes. They weren’t pre-warrant (Prince Chuck’s fleur-de-lis was on the back label), but they weren’t the most recent livery either and, at the time, we didn’t have a code for late 1990s 10yo (we do now). I asked if I should create a new code and got told no – just count ’em as normal 10yo and we’ll send them to a bar. I said if we were going to do that, I’d probably buy them myself for curiosity value. No objection was raised to this proposal. A month or two later, feeling thirsty of a Friday evening, I popped one of the bottles open for a dram. Instantly, my nostrils were filled with an unexpected, and wholly wonderful, tropical fruitiness. I was astonished. Where was the peat? How had this ridiculously ripe exotic fruit got into this bottle of Laphroaig? 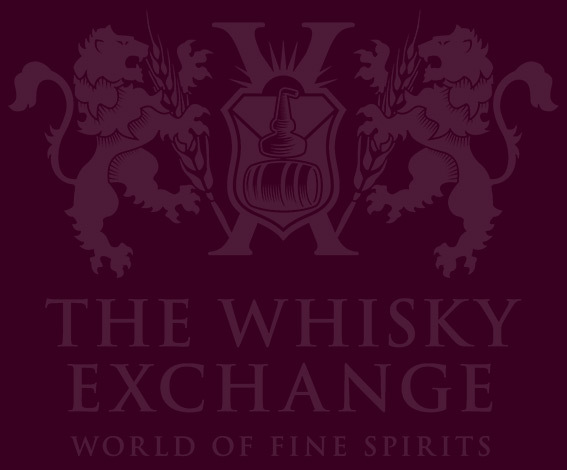 I got the definitive answer a year or two later, when Mario Groteklaes came over to The Whisky Exchange Whisky Show. During his phenomenal Rare & Unusual Islay Classics Masterclass, Mario explained that when Laphroaig increased their number of stills from four to seven between 1967-72, their floor maltings could no longer produce enough barley to fulfil their requirements. 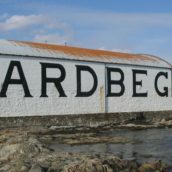 The distillery had to source peated barley from commercial maltsters, but these suppliers could not provide barley with the same high ppm as Laphroaig produced themselves. 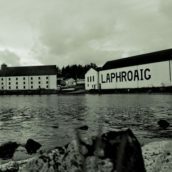 As a result, the average ppm of Laphroaig’s spirit plummeted to about half its previous level, and the distillery’s spirit went through a well-known (among geeks) ‘Fruity Period’ for about a decade until the early 1980s. Clearly some of that spirit had still been around when my Laphroaig had been bottled (or similar problems had been encountered in the mid-80s as well). 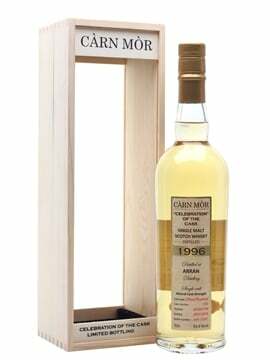 I can’t help wondering if bottle ageing has somehow enhanced the fruitiness of this whisky over the years. Surely it can’t have been like that when it went into the bottle. I started drinking whisky in the late ’90s and I don’t remember having any Laphroaig like this. Maybe some of our readers of a certain vintage will know. I quickly opened the other bottle to see if it was the same. It was horrible – ashy dishwater (perhaps bottle ageing again?). I was surprised, but not deterred. Examining the two bottles, which to a cursory glance appeared the same, I noticed some differences in the front and back labels. Lot numbers. The presence or absence of recycling symbols. These Laphroaigs were certainly produced within a short time of each other, but they weren’t the same. And my whisky-buying habits have never been the same since. 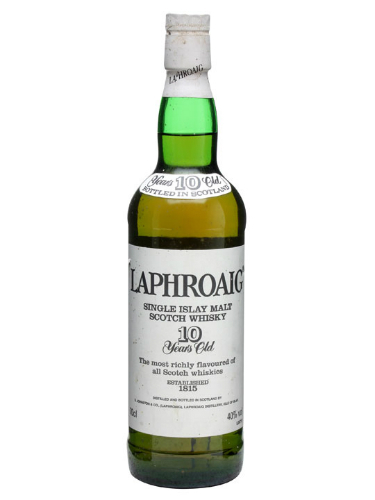 Today, I’ve stopped feverishly combing internet auction sites for old Laphroaig 10 year olds. I still comb them, just not feverishly any more. But a year or two ago, I was all over it. I kept finding slightly different combinations of label lot numbers. I was being ridiculed at work. These days sometimes a full month will go by without me buying any more Laphroaig 10yo. Back then I was buying everything I could get my hands on. 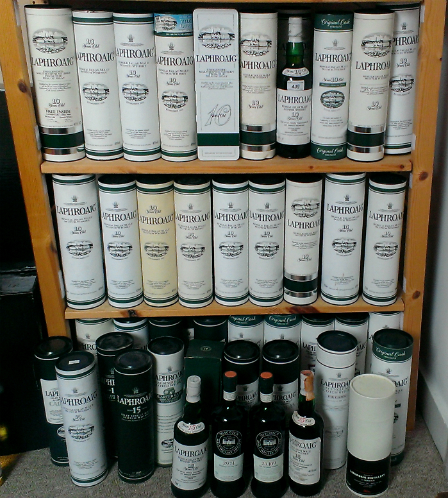 And they were so cheap – only a few quid more than a normal bottle of Laphroaig 10yo, in some cases. I bought far and wide. Sometimes I would receive phone calls from lovely Scottish people in Aberdeen or Dundee asking when I was going to collect a bottle I’d bought six months previously and forgotten about. Friends and relatives living in the country collected random lots I’d bought online from provincial auction houses – one of my best ever scores was four bottles of Laphroaig and two bottles of early 1990s Black Bottle that I won via absentee bid from an auction house in Gloucestershire that turned out to be in the next village to my wife’s parents. I think I paid just over £100 for all six, including commission. Bottles were arriving from all over the UK. I tore the parcels open to see if they had the magic combination of lot numbers I was looking for. Generally, they didn’t. I started amassing doubles, and cracked a few open to see what they were like. 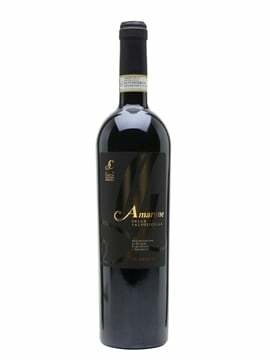 To my delight, I found them fantastic – not as transcendent as that first bottle, but still far, far better than anything else you’d spend forty or fifty bucks on nowadays. The old pre-warrant litre bottles for duty free were particularly good, like apple crumble with melted vanilla ice cream and just a trace of smoke. I continued my quest. 1) Yes, I did eventually pick up a few more bottles with the magic numbers. 2) Yes, they were just as good. 3) No, I’m not telling you the combination. Nowadays, the prices of these bottles have started creeping up, although they’re still very reasonable for what they are. I’ve calmed down my buying because I’ve got a pretty healthy collection, although I’m certainly no Marcel van Gils, sadly. My humble efforts pale by comparison. I don’t drink an awful lot of whisky at home, so my bottles tend to get opened at (whisky-based) parties or events, and unless they get finished on the night they tend to last a while. In the three years since I started, I’ve got through probably a dozen bottles, with a lot of help from my friends. I reckon I’ve got enough for a few years yet. Also, my wife was getting cross. I should add here that all of this is no reflection on today’s Laphroaig 10 year old, which is still my go-to dram in pubs, and which I still thoroughly enjoy every time I have it. I don’t expect it to taste the same as it did back in the ’90s, that would be unrealistic and unfair. But I have a few bottles that I’m putting away for a while, as an experiment. I even have a bottle of Laphroaig 10 year old with my name printed on the label. It was a Christmas gift – even my non-whisky-drinking friends take the piss out of my obsession. The named bottle thing is a service provided on the distillery website, and it made a sad git very happy last December. Maybe I’ll open it on my 50th birthday. Just to see.